The first nine years of ‘Crosses By Woody’ has been an exciting and challenging adventure. Wherever this journey has taken me, I have met or talked with people are drawn to the unique designs of these crosses. 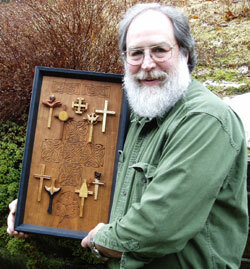 Each day I meet a new person whose story of faith finds expression through one of the crosses. People have wondered if I ever get tired of making the crosses and the detail precision of the joinery. I never do because I know that each cross I make is finding a deeper spiritual connection within a person’s life. I love my work because it is a new extension of the educational ministry that I enjoyed in the parish for so many years. My own faith has grown with a renewed appreciation of the greater faith journey that each of us are on and value those places of intersection where we can sit and talk about how to design a cross that is most expressive of the faith experience. Many years ago I was fortunate to meet James Lorette. 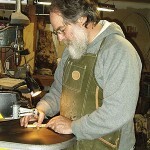 I was struck by his passion for the “story” within the wood and his commitment to excellence. Now I listen with both ears hearing two distinct stories. 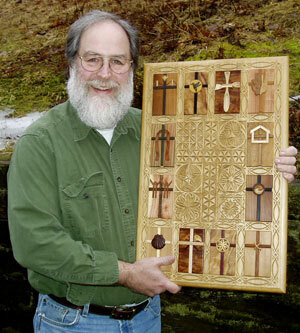 One is the story of the wood – the story of the Cross – the story of each design that speaks to a living faith – Christ’s faith. The other is to the story of the person who is looking for a cross knowing that is more than a piece of jewelry. It is the story of a person who wants something special for a colleague who is retiring. It is the story of a group who is setting off on a special mission ministry and the leader wants something for the journey. It is the story of a parent who wishes to celebrate the Confirmation of her son. It is the story of a seminary wanting to give their new graduates a replica of the cross in their chapel as they step out onto a new path. It is the story of a young boy whose ‘thumbs up’ spirit enabled those around him to find the hope of faith as he moved from this world to the next. It is the story of those who celebrate Baptisms and weddings, who search for the healing power of faith, who confront difficult transitions and who seek the Promise and Hope of the Resurrected Christ. It is where the two stories meet that the designs of these crosses find the greatest expression. This is why I don’t have an inventory of pre-made crosses! I wish to honor each person’s faith story within a cross, bowl or spoon that is made for the individual. This is especially true for the custom crosses where both my design AND woodworking skills are stretched and challenged. During the past nine years, several new cross designs have been introduced. 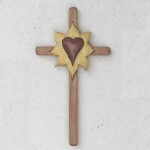 Along with the crosses, I now offer two new products that are centered in faith and the Spirit. The first are the Bowls of Healing. 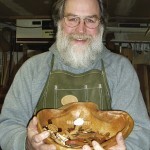 I have always loved the process of carving and sanding bowls from burls. One day, Janet and I were looking at a piece of property where we eventually built our new home. She handed me a very different piece of wood asking me to carve it into a bowl. It was unlike any other bowl I had carved. It was the first Bowl of Healing carved from the place where a branch had been broken off many years earlier. In subsequent years, the tree had grown over the wound. The inner grain is beautiful. The theology is profound! Now when I walk through the woods, I see the trees a bit differently. The second product is a developing assortment of Welsh Love Spoons. When our daughter, Alana, married Chase, I was asked to make something special for her wedding party. Several years earlier I had tried my hand at making a Welsh Love Spoon. So began the wonderful process of blending the rich tradition of these spoons with the beauty of Celtic knots. Recently I have experimented in adding carved disks into the spoons using chip carved mandelas. I am an ordained “honorably retired” Presbyterian Pastor, with a degree from McCormick Theological Seminary in Chicago. In 1984, Janet and I moved with our two children to Keene, New Hampshire, where I was granted dual standing in the United Church of Christ. I served as Associate Pastor of the United Church of Christ in Keene for 21 years. Janet is a teacher at the Keene Montessori School. Our children grew up in Keene and have established their own lives. Janet and I have moved to Westmoreland, New Hampshire where we enjoy our gardens and woods. Obie, our cat, continues to assist me with quality control when he is not talking with the turkeys or deer who come out of the woods for visits (and a snack). My own journey began with a simple cross, designed for a small group of youth who went to help those victimized by flooding along the Ohio River. Out of the trip, the Cross of Shelter emerged. Now with dozens of new designs and thousands of crosses made, I look forward to the next chapters of the ‘Crosses By Woody’ story. I am sure that they will be filled with wonderful stories and lots of saw dust.